India became independent in 1947 and a republic in 1950. 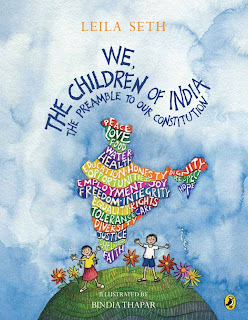 Our constitution, the backbone of our country and the document that defines and governs all aspects of our lives as the Citizens of India came into force at that time. 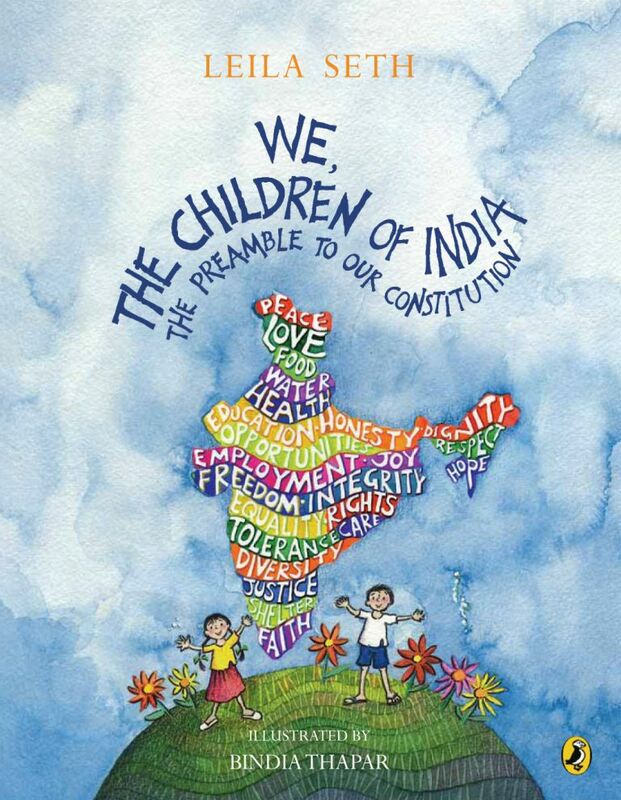 All of us, as citizens of independent India, have been introduced to its Preamble. But how many of us actually know what it really means? It has been usually seen at the beginning of textbooks, learnt by rote, and then put into the slot of dreary civics and all but forgotten. Here is book which hopes to change all that, which brings out the essence of it in a fun way. Leila Seth was the first woman judge of the Delhi High Court and the first woman Chief Justice of a state in India. Her credentials listed on the introductory page amply testify to her being the best person to have taken up this project. By her own admission, this book has been written with the help of her grandchildren, ages 5 and 8. She is also mother to another writer of note, Vikram Seth. Leila Seth has beautifully deconstructed the heavy vocabulary of the preamble to make it comprehensible to all. She has gone word by word, giving succint examples and explanations with the help of speech bubbles--with a lot of help from the vivid illustrations by Bindia Thapar. everyone should be able to lead a healthy life and be able to go to a doctor when they need to"
Clearly explained, with happy illustrations. My favourite are the words used while explaining "Secular". To the names of all the religions prevalent in India, she has added other belief groups: "Agnosticism, Atheism, Rationalism, Humanism, Animism". There are so many people who belong to these categories, too, other than those belonging to known, documented religions. They are part of "We, the people", and are included in the whole. Secular! On each page, there are boxes where we are given the facts pertaining to those words. There is also a short account of the events leading up to and culminating in our constitution as well as an account of the people involved in writing it, with wonderful photographs. The book ends with a simplified version of the Preamble with the word "people" replaced by "children", a short account of what needs to be done, and a short poem to help us remember the spirit of the preamble. Free to love and free to care. Strong to build a happier land. Unified in love and trust." A wonderful and timely book, making the preamble easy to understand for all, and more important, easy to remember and follow. A true gem. Thanks again for the review and for getting us the book. Wish there were more books like these. @Lavs: I agree, it is a wonderful book. Thanks for your vote of confidence. We enjoy what we do here at ST, and shall proceed to pat our collective backs.Thanks. I picked it up at Landmark for Rs150. It is available at Flipkart for Rs 131. I think they charge shipping only if the total is below a certain amount, so you'll need to check with them. It makes sense then to put together a list that you want to order and avail of free shipping. Thanks Sandhya. Kind of book that I was actually looking for to read to my kids. My son has started Social Studies as a separate subject from this year and they have been introduced to a lot of info about India, but I found this part missing in the textbook. Will order this right away. That's good to know, Vibha. From my personal experience as a child in school, I remember that the parts that tend most to stick to you are those over which extra effort has been taken, in terms of making it interesting. As opposed to just learning it. An argument in favour of montessori teaching today, I think, not seen much in my growing up years. What a fabulous book this sounds like - Civics was one of my favorite subjects at school (thanks wholly to my teacher and NOT to the dreary textbooks). I think this will be a keeper ! @Poppy: Yes, it is so true that a good teacher can make such a difference. I can relate to that too. Sounds awesome. Will add this to my list. And as the child discovered today from the author herself, Vikram Seth has helped pen that poem! What an honour it was to meet Leila Seth! Chox and I, with the kids, met the author herself today. It was a wonderful experience. She answered all questions put to her by the kids and drove home the point to them that they, and children like them were the future of our country.